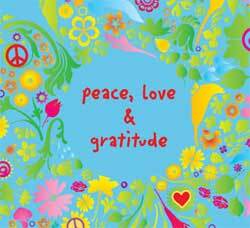 Infinite Love and Gratitude: What Do They Have in Common? Emotional scale, which is the “place to be” if you want to tap into happiness and manifest your desires when dealing with the Law of Attraction. But, before we get to the “twist” at the end of this article, let's look at exactly what gratitude is and how to develop it. But that definition doesn't really mention "love" other using the word "emotion" when acknowledging a benefit. Since we all "love" benefits, I suppose that you could relate this definition to love by keeping an attitude of gratitude because you feel love when you're feeling good emotions in general. But, I think there is a stronger tie to love, which I'll tell you about in a minute. Before we venture into the really cool part of this article about the association that I've found between love and gratitude, let's take a moment to understand that it's really easy to develop gratitude. By making a conscious choice on a moment to moment basis to be grateful for “whatever” comes up in your life, you instill the ability to do that more and more often, which will improve your life overall. How can it do that? Simply because you're focusing your mind on the positive - and you know me, always looking at the positive - which can have a significant impact on your life and your health. To learn more about how to develop gratitude, check out my "How to develop Gratitude" article by clicking here. Be sure to come back after you're done by clicking the back button so I can tell you what I've figured out about infinite love and gratitude. What can gratitude teach us about love? First thing that comes to mind is that when we're feeling grateful, we're “loving” the state of harmony that we're experiencing at the time of feeling appreciative. Does this count as infinite love? Sure, especially when you consider that as you are practicing an attitude of gratitude, you are changing your heart rhythm to come into a more coherent state, which has been proven to affect others around you. How does it do that? Well, since this is how I came up with my theory about how infinite love and gratitude relate, take a moment to read my article, “As We Express Our Gratitude, We Change the World Around Us.” Click here to go there now and then come back. The reflections of gratitude that I take away from the results of that study is that our heart is a major contributor to sending out an “infinite signal” around us. When we're affecting this organ in our body – our heart – we're also sending out an “infinite signal” (although we can't measure it yet.) So, I'd say it's pretty safe to say that infinite love and gratitude go hand in hand when manifesting happiness and positive change in ourselves and the world around us.